Using data is a key component of the teachers’ role. 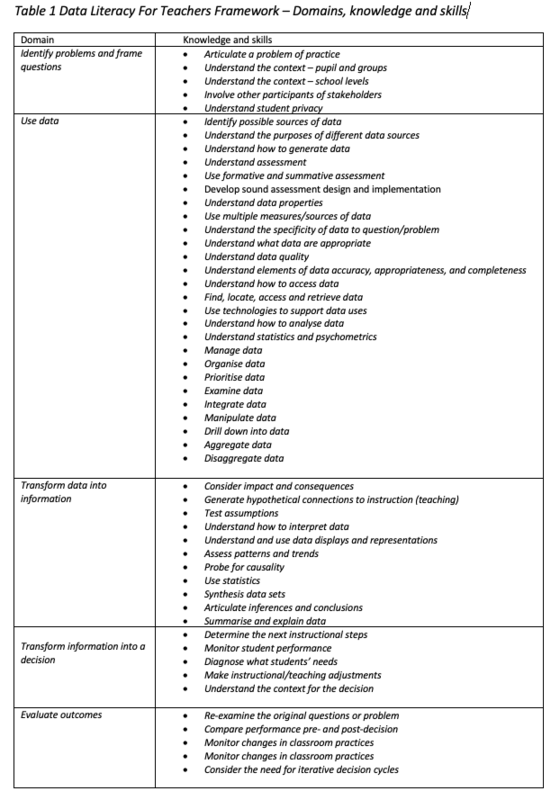 In England, the 2011 Teacher Standards – updated in 2013 – state that teacher should use ‘relevant data to monitor progress, set targets, and plan subsequent lessons.’ However, as Mandinach and Gummer point out – this type of statement is extremely general and does not provide any guidance about the knowledge and skills necessary to be data literate. In order to address this issue Madinach and Gummer offer up this definition of data literacy for teaching. Mandinach and Gummer then go onto state three propositions on which their work is grounded. 1. There is no question that educators must be armed with data? 2. Assessment literacy is not the same as data literacy. 3. Simply relying on professional development to develop teacher data literacy is not enough and a conceptual framework is required. Second, what are the implications of the DLTF for schools wising to incorporate ‘disciplined inquiry’ either as part performance management or continuous professional development? (see https://www.garyrjones.com/blog/2019/3/23/performance-management-and-disciplined-inquiry). Initial reflection would suggest that if you accept that teachers in a school will have varied levels of data literacy – then it’s unlikely that a single model of disciplined inquiry or type of inquiry question is likely to appropriately meet the development needs of all teachers. Indeed, before embarking on ‘disciplined inquiry’ it may be wise to undertake some form skills audit – so that you start off where colleagues are rather than where you would them to be. This can also help you put in the place different packages of support relevant for teachers at different stages of the development of their research literacy. Third, although there appears to tide appears to be turning against the importance of internal school data , especially in the inspection of schools (https://www.tes.com/news/ofsted-inspections-wont-examine-internal-school-data) that does not mean this framework is any less relevant. Indeed, what this framework does is emphasise that data literacy is not just about – assessment or progress data– but is far more comprehensive. If you are interested in becoming more data literate, then I recommend that you have a look at Richard Selfridge’s book - Databusting for Schools: How to use and interpret education data.